Dana 60 Front Spindle bearing and seal kit. 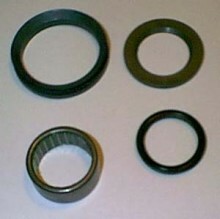 Kit includes roller bearings, Outer dust seal, spindle spacer and inner seal. Fits Ford, GM and Dodge (74 to 93). Sold individually. One kit required per side. Note: International and Non-Continental United States orders - Additional shipping charges will apply. Please contact us for shipping quote for all orders outside of the Continental 48 states. Click the button below to add the Dana 60 Spindle Bearing and Seal kit to your wish list.